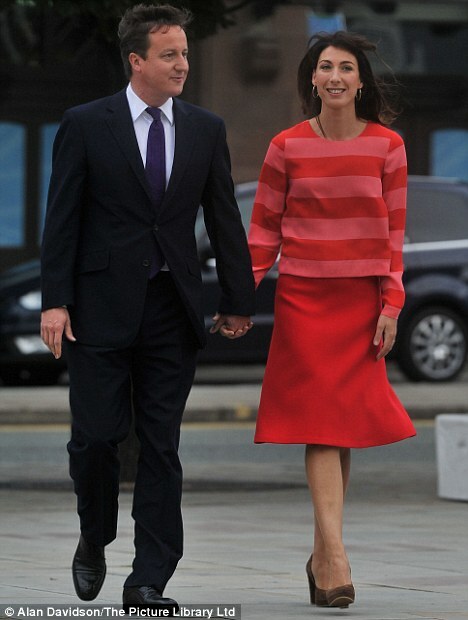 There is no denying Samantha Cameron was in great shape at last week’s Tory party conference. Last year, the 40-year-old recruited celebrity trainer Matt Roberts to help get her body back in shape after the birth of her fourth child, Florence. Roberts is known for his unforgiving approach to fitness, advising his clients to avoid alcohol on five days a week and to work out intensely at least four days a week. SamCam is a keen runner and Roberts has her incorporating bursts of speed and hills into her regular jogs. But she also performs a routine of tough strengthening moves and some weights. What you can try: ‘The Plank’ is a great exercise for whittling away the waist. Lie face down with your elbows on the ground; elevate your body so you’re on your toes, keeping your weight distributed between your forearms and feet. Your elbows should be bent at a 90-degree angle. Keep your back straight with the hips raised off the floor. Squeeze the torso tight, ensuring the body is parallel to the floor. Hold this position for one minute.